Debbie: Yay for Fran! Our first teen NaNoWriMo character, SO excited about her first NaNoWriMo. I’m a Fran. Glad to see a teen newbie in the toons! I was 14 when I first started NaNo. Haha. BECAUSE I HAVEN’T BEEN TWELVE FOR QUITE A LONG TIME NOW. Debbie, could you be so kind as to explain to Errol that I’ve been out of elementary school for a few years now, and therefore he should snap out of the ludicrous idea that I am twelve years of age? Thanks love. 14? Wow, I’m so impressed! I’m so happy to see a teen character on the nanotoons! I was turning 16 when I first heard about NaNoWriMo! It really made me happy to participate my first year and I’ve been back every year since. I’m turning 18 this year, since my birthday is in the middle of Wrimoing (seriously, my birthday is the 15th) and I absolutely love it!! How wonderful that you’ve doing NaNo every year since you were 16. That’s fantastic!!! Whoa. I just realized that I started it when I was twelve.maybe. seems like I’ve been doing it longer, but nano will do that to you. I was 15 when I did my first NaNo, and I’m 19 now. Not planning on stopping anytime soon! It’s good to see some teen NaNos in the comic! 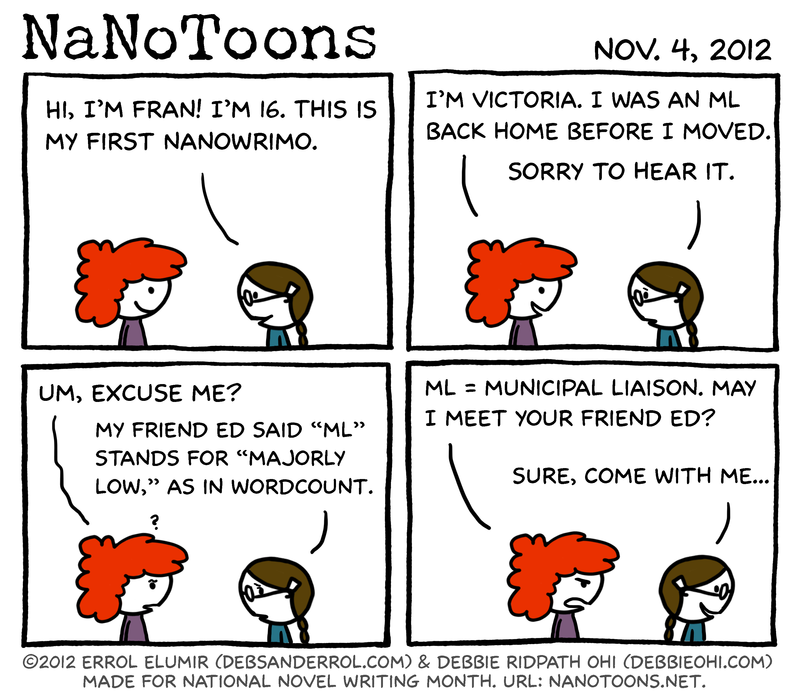 So this is your last year doing NaNoWriMo as a teenager, Marci? Good luck with the writing!